Previous Article Will the early bird still get the worm? An ONC (Ocean Neutrinos Canada) project brings new meaning to “ocean observatory,” as ghost particles from deep space pass through the deep sea. Could the world’s next large-scale neutrino detector be built at the bottom of the ocean? 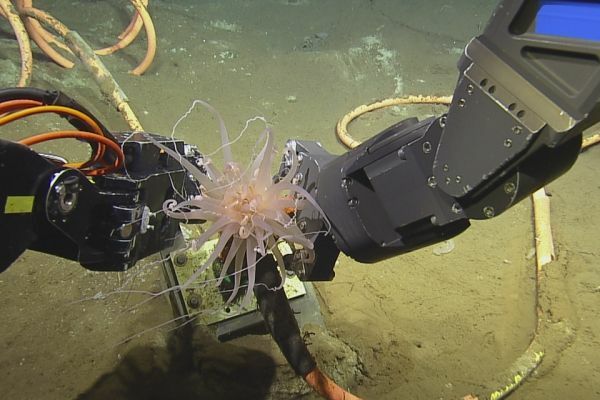 This summer, as part of its 2018 Wiring the Abyss expedition, Ocean Networks Canada (ONC) is installing specialized equipment at its deepest site in the northeast Pacific Ocean to assess the location’s suitability for observing neutrinos. Neutrinos are one of the universe’s most essential and difficult-to-study ingredients, sometimes dubbed “ghost particles” because they travel across the universe and through normal matter—including the centre of the Earth and human bodies—at nearly the speed of light without interference. They’re also one of the universe’s most abundant subatomic particles, produced by nuclear reactions from solar fusion, radioactive decay and exploding stars. That’s why increased knowledge about neutrinos could help answer some of the fundamental questions in astrophysics—such as those posed about the Big Bang and supernovae—and provide insight into the origin, evolution and fate of the universe.